Spend a romantic evening with your loved ones at Santa Monica Symphony’s Spring Concert as we present works by Wagner, Schubert and Brahms, three of the most prominent German and Austrian composers in the Romantic period. The evening begins with the brilliant sound of the horn and other brass instruments in Prelude to Act III of the opera Lohengrin by Richard Wagner. The vividly colorful instrumental timbre continues in the next piece, Franz Schubert’s Symphony No. 8 in B Minor, also known as his “Unfinished Symphony”. Closing the concert will be Johannes Brahms’ powerful and dramatic Piano Concerto No.1 in D-minor, featuring internationally award-winning Korean pianist So-Mang Jeagal. 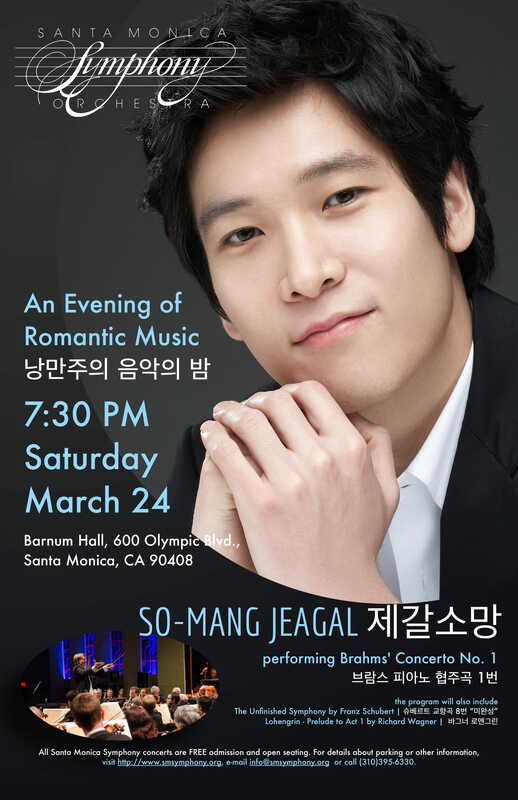 The concert will be held at 7:30 pm on Saturday, March 24, 2018 at Barnum Hall on the campus of Santa Monica High School. All Santa Monica Symphony Concerts are FREE and open seating. Pre-concert lecture by composer Russell Steinberg will be held from 6:30 – 7 pm.